7. 3-Day UPE workshop on, "FPGA based system design using in LABVIEW and CRIO", organized by Department of Instrumentation Engineering, MIT Campus, Anna University during 17th to 19th September 2018. 6. Three days workshop on Hands-on training in, "Image Processing, Computer Vision and Machine Learning (3rd IPCVML 2018)", organized by Department of Electronics Engineering, MIT during 3rd to 5th May 2018. 5. DST Sponsored workshop on Hands-on training in, "Programming Embedded System (PES 2018)", organized by Department of Electronics Engineering, MIT on 9th and 10th March 2018. 4. Two days workshop on, "Embedded System Design Flow on Zynq using Vivado", organized by Department of Electronics Engineering, MIT on 5th and 6th January 2018. 3. Three days Hands-on training on, "Image Processing, Computer Vision and Machine Learning (2nd IPCVML 2017)", organized by Department of Electronics Engineering, MIT on 23rd to 25th November 2017. 2. Two days Hands-on training on, "Image Processing, Computer Vision and Machine Learning (IPCVML 2017)", organized by Department of Electronics Engineering, MIT on 27th and 28th January 2017. 1. UGC sponsored workshop titled, "Hands-On training in Embedded C Programming of PIC Microcontrollers", organized by Department of Electronics Engineering, MIT on 1st and 2nd March 2016. 13. Participated in 5-Day UPE workshop on, "Fundamentals of Reliability", organized by Department of Electronics and Communication Engineering, MIT Campus, Anna University during 29th October 2018 to 2nd November 2018. 12. Participated in the 3-Day UPE workshop on, "FPGA based system design using in LABVIEW and CRIO", organized by Department of Instrumentation Engineering, MIT Campus, Anna University during 17th to 19th September 2018. 11. Participated in GIAN Course on, "Laser assisted surface micro and nano fabrication", organized by Department of Mechanical Engineering, IIT Indore during 8th to 14th July 2018. 10. Participated in AICTE approved Faculty Development Programme (FDP101x) on, "Foundation program in ICT for Education", conducted by IIT Bombay from 8th March to 12th April 2018. 9. Three days workshop on, "Advanced Digital Design Flow using Cadence", organized by Department of Electronics Engineering, MIT Campus, Anna University during 1st to 3rd March 2018. 8. Two week faculty training programme on, "Nano Instrumentation System and Biomedical Nanotechnology", organized by Department of Electronics and Instrumentation Engineering, B. S. Abdur Rahman Cresent University, during 3rd to 16th November 2017. 7. Pre-conference tutorial on, "Performance optimization techniques for large multicore processors", organized by Rajagiri School of Engineering & Technology, Kerala on 6th September 2016. 6. Two day workshop on "Embedded System Design using Atmel ATmega XPLD mini 168PB and ARM based SAMD21", organized by ATMEL India University Program in co-ordination with Coimbature Institute of Technology between 19th and 20th April 2016. 5. 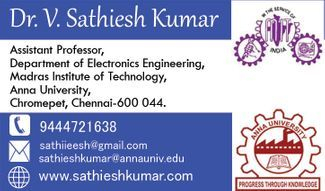 Two day workshop on "Embedded SoC Design", organized by Department of Electronics Engineering, Madras Institute of Technology, Anna University between 7th and 8th March 2016. 4. Two day workshop on "Internet of Things", organized by Department of Electronics Engineering, Madras Institute of Technology, Anna University between 5th and 6th January 2016. 3. 7 days faculty development program on "Embedded Systems", organized by Department of Instrumentation Engineering, Madras Institute of Technology, Anna University from 30th November 2015, 1st December 2015, 16th to 20th December 2015. 2. ILA Short term course on "Automation of Laser physics experiments" at S.V.University, Tirupati (1-2nd December 2014). 1. SERC School on "Laser Produced Plasma : Physics and Applications", July 9 - 21, 2012, Raja Ramanna Centre for Advanced Technology, Indore 452 013, India.